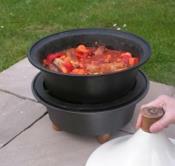 Netherton Foundry Cast Iron Garden Hob with tagine. 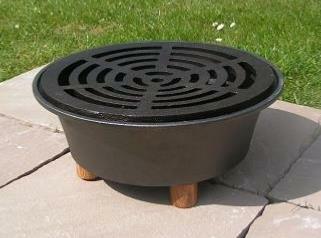 Cast iron charcoal bowl with Welsh oak legs and cast iron cooking grid. 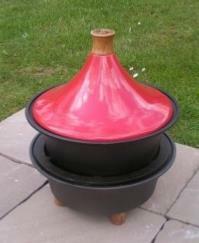 Pre-seasoned cast iron bowl and red ceramic tagine lid with Welsh oak knob. The stylish red stoneware conical shaped lid helps preserves moisture in the food, as the steam condenses on the inside of the lid. The shape of the lid also creates a circulation motion within the dish infusing the food with spices and flavours. 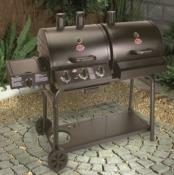 This charcoal Tagine barbecue is ideal for family BBQ parties, no assembly required and easy to control. Sturdy construction in cast iron. Super long lasting quality from the Natherton Foundry. Enjoy traditional Moroccan Tagine cooking over charcoal. 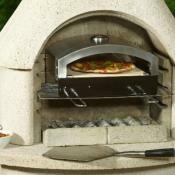 Traditionally used by nomads as portable ovens over charcoal. 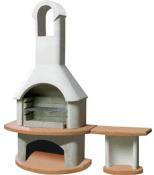 Can also be used as a charcoal BBQ grill which will result in the most tastiest food. A combination of charcoal and cast iron is the best ever! The low heat produces a rich, aromatic flavour as the food slowly simmers for several hours and the resulting meat becomes meltingly tender. Diameter 31cm X 38cm high.